In case you hadn't heard, the Extended Cut for Mass Effect 3 has been realised. This is apparently BioWare's "clarification" of the endings that shipped with the game. 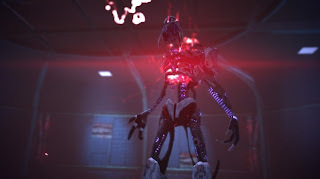 After repeated adamant and somewhat sanctimonious statements that the ending could not and would not be changed, BioWare have demonstrated that their original ending was poorly written and overlooked basic elements of the Mass Effect lore and setting. However, it seems that the people responsible ultimately failed to recognise its fundamental flaws. Bandaid solutions were implemented to solve basic and superficial flaws like Joker's inexplicable retreat and crash landing, the magical appearance of your squadmates on the Normandy and why Hackett suddenly attempts to communicate with Shepard on-board the Citadel. However, each one of these introduces more completely irrational consequences and questions. How Normandy wasn't shot by Harbinger as a result of landing right near the Conduit beam it was supposedly protecting, why the Normandy decided to land on a random jungle planet for some rest and relaxation after the biggest galactic war ever, or even why the ridiculous stargazer sequences is included when the epilogues suggest a huge technologically advanced spacefaring galaxy, are just some of the new issues introduced. What's arguably worse is the fact that BioWare did change their ending despite saying that it was unchangeable. The destruction of the Mass Relays, which was specifically stated as an outcome from the Catalyst no longer occurs. In fact, this line has been removed entirely from Shepard's exchange with it. 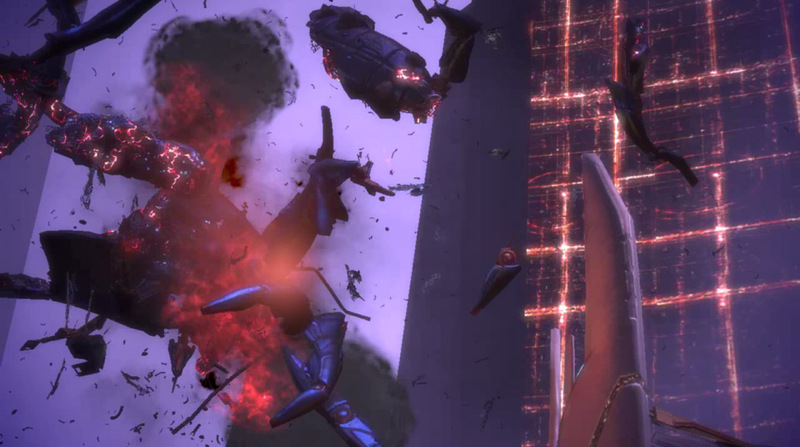 After BioWare staff insisted "the relays are only disabled" despite the Catalyst explicitly stating they would be destroyed, and The Arrival DLC indicating the destruction of a Mass Relay was equivalent to a star going supernova, BioWare were seemingly forced to recant this assertion from the Catalyst. 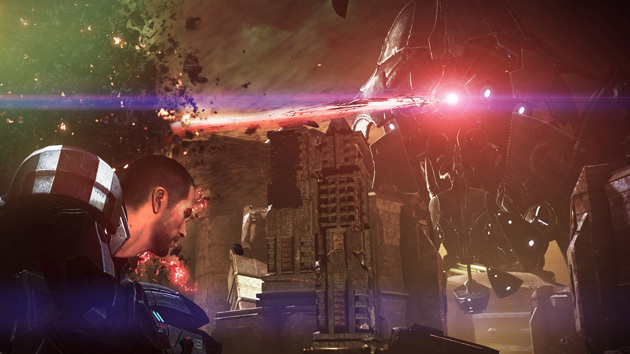 Other changes, including adding a completely new ending where Shepard can refuse the options presented and instead ensure the galaxy's defeat also is a change to the ending. In doing this, BioWare have seemingly attempted to appease fans, but ultimately all they've done is admit through their new content the original ending was grossly flawed and poorly executed. To simultaneously insist it was not in any way flawed or that fans "misinterpreted" the original ending is a misappropriation of blame. The blame lies squarely on one end: BioWare's. Furthermore, the Extended Cut does nothing to address the fact that the Catalyst's arguments classically beg the question (i.e. it uses its own assertion as proof of its assertion), are logically inconsistent for every provided option, and the ending is inherently at odds with virtually all the key themes pushed by the series up until this point. The Extended Cut is a series of bandaids across a series of mortal wounds that do nothing to address the ultimately fatal blow to the coherency of the Mass Effect series. It's okay if everyone turns into this. We have green lights instead of red! That's makes it good! You watched Star Wars, right? 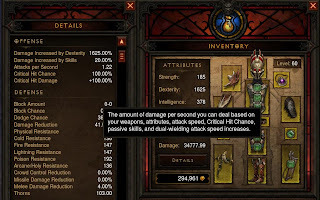 If the my previous posts about items and general design issues with Diablo 3, herein lie the final nails into the coffin of Diablo 3's credentials as well designed game. 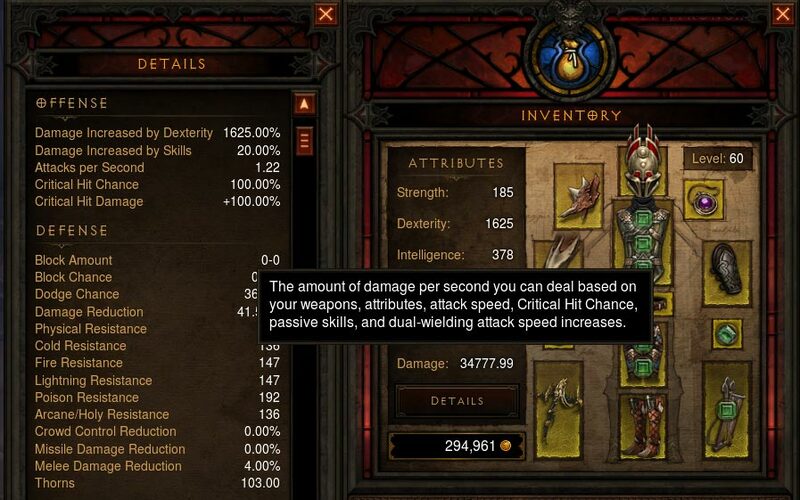 Inferno difficulty, which is the hardest difficulty in Diablo 3, showcases the sheer laziness and lack of consideration on Blizzard's behalf when it comes to gameplay. As can be seen in this video, Blizzard's approach to difficulty is one of the worst possibilities: Just increase the numbers. Jump to 38 seconds in: "We doubled it." If your difficulty is such that designers can simply "double it" in order to increase the difficulty, then you need to hire new designers. Also, if you think that your test team is half as good as your playerbase, then you probably need to hire better testers. There is absolutely no excuse for this type of laziness. It is indefensible. Nor is there a justification for taking skills and dramatically reducing their effectiveness, even doubly so when there is no indication this has occurred. On Inferno difficulty, life steal operates at 20% efficiency. i.e. A weapon with 3% lifesteal per hit will drop to 0.6% per hit on Inferno. However, there is no indication that this occurs, so it is up to the player to realise (and calculate) this based on observation. Despite this being grossly misleading for the player, it raises serious questions about the competency of the design team. If a skill must suddenly be rebalanced by such a huge amount upon changing to the highest difficulty level, then this indicates a gross imbalance in the difficulty balance before or after this change. A well designed skill and power curve should not require such colossal changes, particularly in a single hit. The real issue here is that Blizzard and Diablo 3 are both suffering from an ingrained and systemic case of duplication. There is virtually no inspiration and practically nothing original in the concepts that have been put forward in the game. Arguably the special abilities of the boss monsters/elites are somewhat new, but these really don't add a whole lot of depth to the gameplay in most cases. 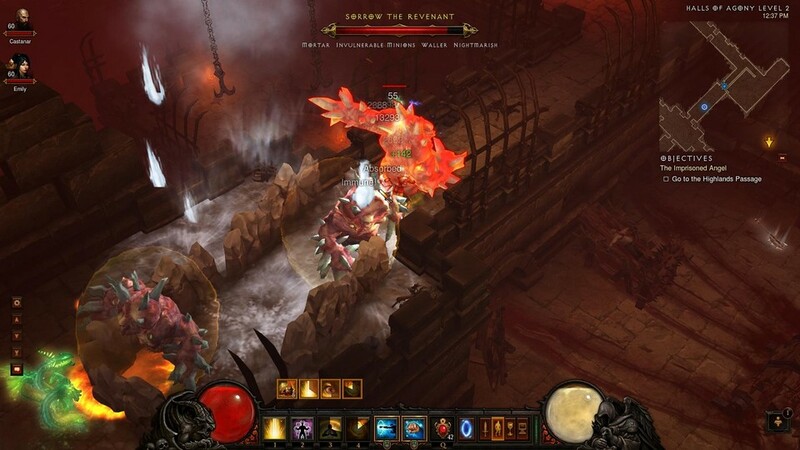 Teleporting and vortex monsters simply making it frustrating for characters attempting to maintain distances, and abilities like jailer and waller often constraint and/or stop movement entirely, which is one of the few tactics at the disposal of players given the extremely small usable skill set that players have available to them. Let's just add more stuff, shall we? The above monster can trap with walls so you can't run away, make you lose control and your hero run away when it hits you (although you'll get trapped because of the aforementioned walls), throw grenades that do lots of damage if you happen to get away (which will be guaranteed to hit you if your hero is uncontrollably running away), and has minions that you can't hurt but can also throw grenades and make you run away scared. The "good" news is that this isn't the hardest combination of enemy abilities you'll face. Instead of coming up with new ways to increase the difficulty of the game and actually let or make player develop new strategies, they just tack more of the existing modifiers that players have already seen onto those enemies. This is the most arbitrary and simplistic way of increasing difficulty, and can lead to some combinations that for all intents and purposes, are effectively unbeatable. Certain skill combinations effectively lead to certain, unavoidable death for virtually all characters. In a recent patch, Blizzard reduced the benefits of running Act III (particularly on Hell difficulty, which comes before Inferno), because "too many people were farming it". This is exactly the wrong approach. Instead of making such areas less appealing, they should instead be focusing on how to make other areas MORE appealing. Why aren't people trying to go through Act IV? Is it perhaps because it is ridiculously short in comparison to the other acts? I'd suggest so. Why aren't people playing Act I Inferno instead? Probably because the difficulty curve takes a massive jump that most players can't cope with, forcing them to farm in Hell difficulty, leaving them with the undesirable option of Act IV or going to Act III. I know which one I want to pick. Act 4 is annoying because of the tactics employed by several of the bosses. 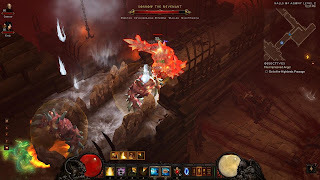 As a ranged character, the two major demons before Diablo, Rakanoth and Izual, feature the ability to deal massive, unblockable damage from a distance that is liable to kill or seriously wound the character. For a start, this is awful design, but what's worse is that Diablo himself can actually turn out easier by compasion. Even more galling here is that Diablo does hardly anything significantly different from his incarnation in Diablo 2. Given at the end of the game he has absorbed the essences of all the other major demons, the fact that he has virtually no new tricks up his sleeve is pathetic. This is in fact representative of the real problem with Diablo 3. Diablo 3's biggest crime is that it is little more than a reproduction of Diablo 2. Act 1 is a similar to Act 1 from Diablo 2 - dark forests, caves, a monastery, Tristram. Act 2 is roughly the same as Diablo 2 - another desert city, parading through its sewers and palace, and an ancient mage stronghold. Act 3 is mostly a reproduction of Diablo 2's Act 5, or the Lord of Destruction expansion - with a army battle, a frozen wasteland and caves, and a descent into a hell. Act 4 is heaven corrupted, which is again similar to Act 4 from Diablo 2. There is nothing new in the level aesthetics for a game that has been in development for years. Taking inspiration and referencing previous titles in the series is fine, but copying them wholesale is nothing short of insulting. Copying your own expansion pack is really the best you could come up with? Diablo 3 effectively just revisits old locations rather than providing something genuinely new to players. Its locales are the same, the majority of its monsters are the same and even behave in almost exactly the same way as they did before. Act 1 and Act 3 even occur in previously visited places. Is the world of Sanctuary created for Diablo so small and uninteresting that the game can't explore new places and characters? 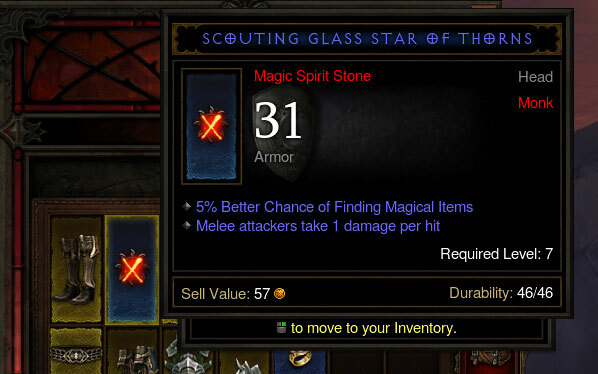 The question this raises is what is actually new in Diablo 3? Unfortunately, the only honest answer is "very little". A lack of originality and new ideas can be seen all throughout the game. Whether from the characters classes, loot structure, the items and bonuses on them, the monsters and areas that just feel like copies of previous games, everything demonstrates a complete lack of originality. Effectively, Diablo 3 has more or less just copied all of its idea from Diablo 2. For a company like Blizzard, this is appalling. It has millions of dollars in its coffers, and has spent years working on this game, yet all it can come up with is something that feels like a twelve year old game with a new coat of paint. I got my money's worth out of Diablo 3, but it's left a bitter taste in my mouth. There's no real depth to the game, and it offers nothing more than a continuous grind to try and roll a lucky number on the item generation slot machine. The simplistic and inequitable gameplay from enemy abilities and lack of any meaningful strategies makes the Diablo 3 experience shallow and repetitive after a while, and presents very little for players after they've reached the maximum level in the game. As a game focussed purely on grind, there is no clear desirable goal to reach for players, merely the lure of "better" items at some point should they be persistent enough. This is the most crude and base player objective in a game: repeat what you're doing so you can repeat it again but more easily. Blizzard should be able to do better, and so should players. I'm glad I experienced Diablo 3, but only because it provided me more lessons on how bad game design. That said, I'm disappointed that I was one of the people who contributed to the game being a success. It doesn't deserve to be. If you're thinking about buying Diablo 3, do yourself a favour and don't. Go back and play Diablo 2 again, or maybe Torchlight, or wait for Torchlight 2. You'll get similar gameplay and you won't be supporting a major publisher producing stale, self-derivative work. Games and gamers deserve better. 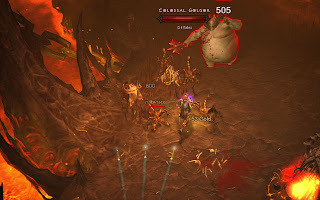 Here I'll take a grabbag approach to Diablo 3's problems, focussing on a few more key areas. Writing has never been Diablo's strong suit. The writers have tried somewhere to create a setting, and in that there is some vague success, albeit in a fairly generic fantasy style. However, Diablo 3 really draws a short straw when it comes to writing. Which would be so bad if it wasn't actually trying to pass itself off as having good writing. It's obvious that it's trying to be well written and have a plot that is engaging to the player, but in no way does it succeed. Blizzard have been asked questions about the quality of writing, but have insisted that they have mostly received praise for their writing. How anyone could possibly praise the writing in the game beggars belief, and this kind of hollow self-praise does nothing to further the gaming industry's reputation as far as producing good writing is concerned. Perhaps two of the most laughable things (and there are many) are the demons Belial and Azmodan, who are supposedly known for their skills in deception and strategy respectively. Yet neither of these demonstrate any whit of either trait. The demon Belial poses as the junior ruler, Emperor Hakan, although it becomes patently obvious to the player that this is the case. For a demon who is meant to be a master of lies, his deception is so transparent that even the player's character isn't fooled, and calls out the trick at the end of Act in what is obviously intended to be a reveal for the player. In the next act, the "master strategist" Azmodan simply places obstacle after obstacle in the hero's path, and is so stupid as to effectively tell them what they need to do next. He is even so foolish and brazen as to tell the player that he sent an enemy to destroy from the inside via the basement of the castle the player is defending. No master of strategy would ever tell their adversary their true plans and actions, yet Azmodan does this virtually every time he speaks. Watch as I reveal my entire battle plan! No, that's not Diablo 3 music. It's much more interesting. I find it hard to believe that for all the advancements we've had in games and technology and the myriad of clones and failings we've seen, that action RPGs still insist on having magical modifiers that are completely useless. No one likes getting a magic item that is completely useless, as it ruins the enjoyment of obtaining the item. No, not every item should be excellent, but no individual property on an item should be useless to every single player. One of the best cases within the genre is "damaged returned to attacker" modifiers. This is where an enemy is damaged upon dealing damage to the player. It needs to be removed from the genre. No ifs, no buts, no maybes. Get rid of it. To anyone who has played an Action RPG, this has almost universally been considered an utterly useless attribute on any gear. It's simply not a useful proposition, and Diablo 3 does nothing to improve that. At higher levels, you can find gear that reflects a couple of hundred points of damage if you're lucky. However, monsters have tens of thousands of hitpoints, meaning it would take dozens of hits to even have an appreciable effect on their life. Of course, it's not possible for characters to take dozens of hits, making this statistic worthless. The genre is all about dealing damage to enemies and trying to minimise the damage the player takes, and reflecting maybe 1% of an enemy's total health when each of their hits likely dealing 10% or more to the player is nothing short of worthless. Blizzard's insistence on keeping this modifier in demonstrates a lack of imagination. This is where Diablo 3 really shows it true colours, and it is found wanting. The auction house allow people to purchase items for money they've earned in the game, buying their way to advancement through virtual or real currency. In essence, this gives the player the option of convenience to obtain items from others than would take a lot time for them to find. 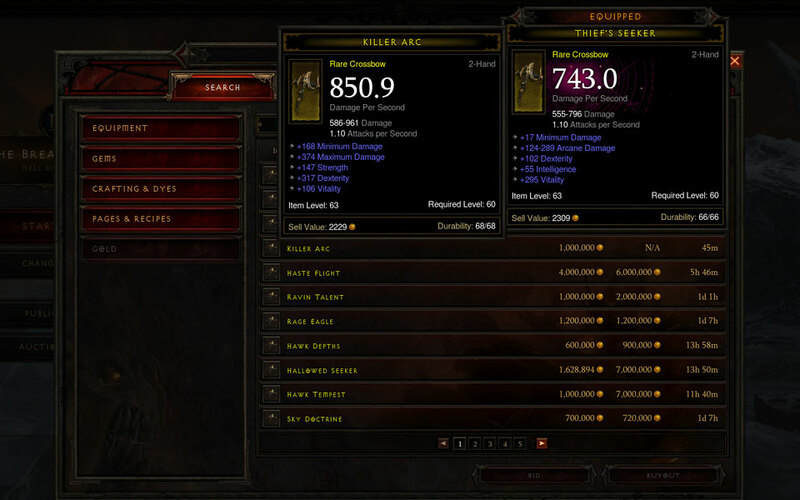 However, this highlights the vapid nature of Diablo 3: it is nothing more than a grind. Kill monsters over and over in order to be lucky enough to find an item you want/need to progress, or simply pay to do so. 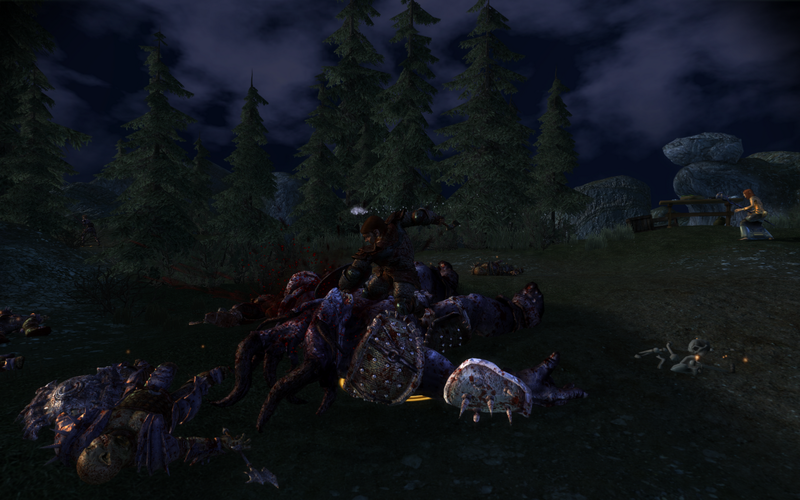 Kill monsters over and over until you make enough money to buy the thing that you want/need. Roll up, come get your items here! This demonstrates that gold farming has effectively become the player's job. Repeat a mindless and fairly menial task over and over again until you are fortunate enough to make sufficient money to obtain something you want/need. I thought games were supposed to be entertainment, fun, and enjoyable, not a repetitive task requiring no real thought or skill. Diablo 3's Auction House says otherwise. It says they're all about grinding and making money. If that's the case, count me out. In the next post, I'll be bringing these points together (and a couple more) to point out the ultimate flaw of Diablo 3. I've spent far too much time playing Diablo 3 since it was released. Blizzard have once again recreated their magic formula to try and addict people to playing a game over and over again in search of "the next great bit of loot" that the Action RPG genre is famous for. The problem is that it's awful. It's addictive, I want to play it, but it suffers from some massive design issues that are truly terrible. I'm going to discuss some of the games issues, in the next few posts, but today I'm going to start with items. 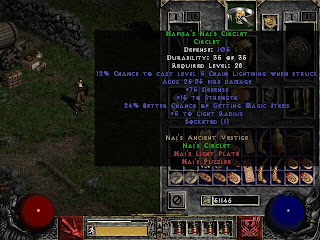 For anyone who played Diablo 2, they remembered traveling Act 1 and getting a set item or maybe even a few. If you were lucky, you might get a unique item with some cool statistics or bonuses you couldn't get elsewhere. Some of these were quite powerful and you might end up using them for quite some time, others were viable if you pursued a particular style of play or tried something a little different to normal. Either way, they added flavour and were something that spiced up the play experience. Players would talk about how they used particular set items or uniques in a fun way. It made the play experience more interesting. 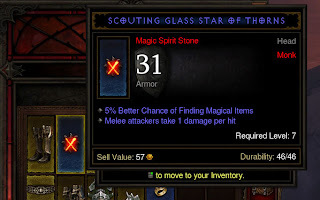 In Diablo 3, Set Items and Legendary (equivalent to D2's uniques) items are rare. I'm not talking "rare" as in yellow items which are called "rare", even though you're liable to get at least a couple in your inventory every single run. I'm talking seriously rare. I'm talking you can play for in excess of 100 hours and never see one drop. There's very little chance that a standard player will see even a single set item drop, let alone be able to form a complete set without doing some serious gear grinding. There are also significantly fewer sets around, and the bulk of them are only available on the hardest difficulty level rather than allowing players to find some of these as they level up. Now, this might all be somewhat acceptable if these items possessed power commensurate to their rarity. The sad truth is that they don't. Even worse is that their power is not even remotely close to justifying their rarity. In virtually all cases, these items will be worse than the rare items that your character is wearing, and even quite possibly worse than blue items your character may have recently acquired. In short, these extremely rare and hard to find items are mostly useless. Yes, Blizzard have said they will improve these items, but the fact they didn't realise how pathetic they were says a lot. 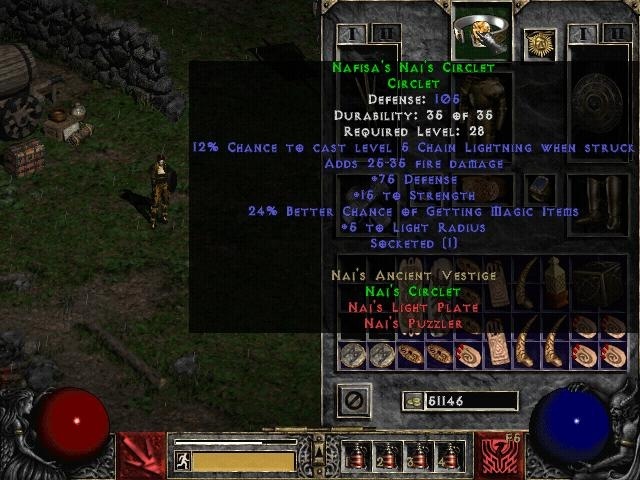 Presumably this exists as backlash against the perceived problem of World of Warcraft and Diablo 2 whereby unique, set items, crafted items and runewords became the ultimate items for everyone to aim for. Once these items were obtained, there was nothing else for the player to do because they had obtained the optimal loadout for their character. This arguably indicates Blizzard's ultimate problem and the design flaw of their game, and potentially the entire Action RPG genre. The genre is a grind. It is a grind for the best loot, the biggest numbers. If the biggest numbers have been obtained, then there is no point for players to keep playing. Blizzard have recognising that their Legendary/Set Items are underpowered and working to fix this issue fails to realise the true fault with their design. The ARPG genre needs to improve. This is Blizzard's chief failure with Diablo 3. They brought this genre to the fore with the original Diablo. They made numerous changes and significant improvements to the formula with Diablo 2. 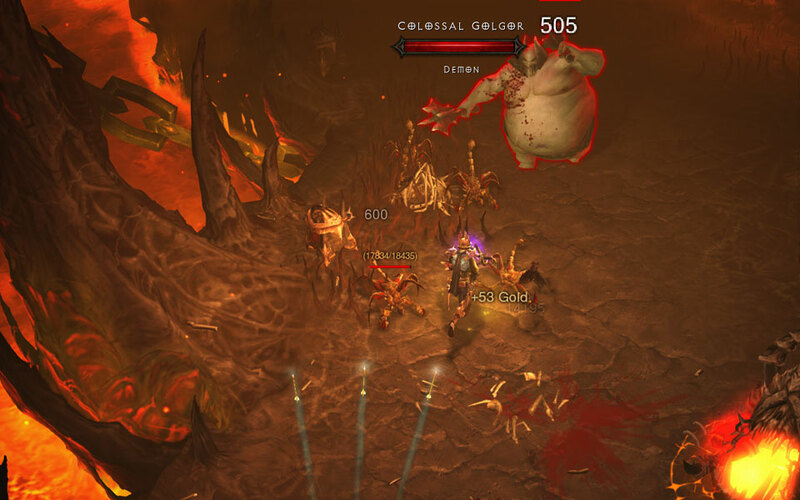 With Diablo 3, they've failed to do much except serve up exactly the same formula as before. New difficulty level? That's okay, just increase the numbers: more damage, more HP! That was okay in 2000. It's been 12 years since then, so it's time to evolve the genre a little. There are indications that they had some vague understanding of this. The concept of not having to rebuild a character because you picked some bad skills is a good one. 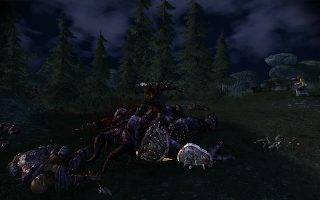 The abilities they added to bosses to force different strategies helped modify gameplay a little (though their execution was flawed in this regard, they did have the right idea). The problem is that there isn't enough of this approach. By and large, it's simply a "make the numbers bigger" approach... and it's simply not damn good enough. Implement real difficulty? Naaaaaah. Just make the numbers bigger! The reason why Diablo 3 ultimately falls short of what it should be is because Blizzard focussed on grinding as the core aspect of the gameplay rather than the action of playing the game itself. 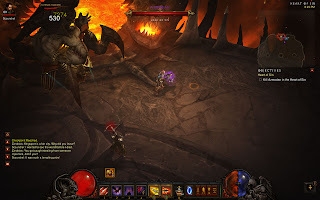 The problem is that Diablo 3 is designed with a World of Warcraft (WoW) mindset. Inferno (the highest difficulty level) is designed to be a difficulty that will force players to grind over and over again in order to get gear with high enough numbers that will allow them to reach the "end" of the game. This is much like how many of the quests in World of Warcraft required months and months of communal grinding to obtain the gear necessary to complete them, (until complaints saw those tasks become easier) the optional content/tasks that can only be completed through ongoing commitment, and time or date based challenged and achievements. All these things are designed to keep people subscribed and keep them paying money. It's designed around a collective mindset and an inherent social gameplay design. Diablo 3 has none of these things. The social aspects of Diablo 3 are minimal. Yes, you can play with your friends, but it's not an inherently social game that requires player cooperation, unlike WoW. Many/most things can be done solo, and it can actually be easier this way. This isn't the case in WoW. Raids are not designed to be run solo. 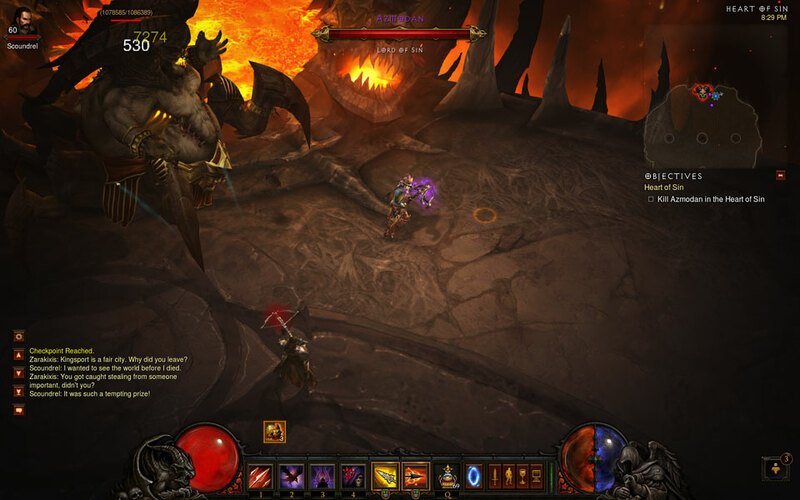 Despite its forced online requirement and the multiplayer aspects of the game, many people still perceive Diablo 3 as a single player experience. Many people want to "take down boss X on their own" because it seems like a rite of passage. Having someone help you would be the "weak" option. When the game first game out, players in a group would see significantly better drop rates of items, which encouraged group play. Now, that bonus appears to have been dropped, and bonuses to magic find are split across a group. So unless someone has a higher magic find percentage than you, you can actually be worse off than if you were by yourself. Compare this to WoW, which encourages and fosters people to cooperate, because no one can learn all professions, and you can always trade favours with friends or guildmates who have different skills to you. The grind exists as part of a social dynamic that allows you and your friends to cooperatively improve and succeed. The grind is a shared task whereby you and your social group improve together. The lack of the strong social aspect of Diablo 3 is why the grind feels so impersonal, and the Auction House exacerbates this problem. Why? Because your friends probably can't help you. They might be able to find something better than your current gear, but that's not likely to be the case, unless they're more advanced than you. Finding better gear is an extremely challenging task, because quite often the gear required to succeed in an area is not found until you are in that area. Thus getting items from other players often makes the player receiving an item feel like they're getting hand-me-down or otherwise "gifted" something that is an advancement rather than earning it. 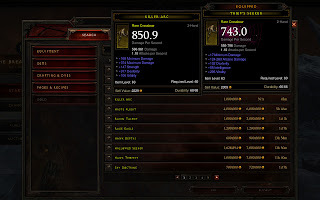 Diablo 3 rarely fosters the personal touch of a mutually beneficial exchange whereby two friends can both give each other items that significantly improve each other's characters. Blizzard have failed to understand that exchange is what made the social dynamic of WoW function successfully. Despite the griefers, the rage, the grind, WoW was successful because it got people enjoying a gameplay experience of working together and helping each other. 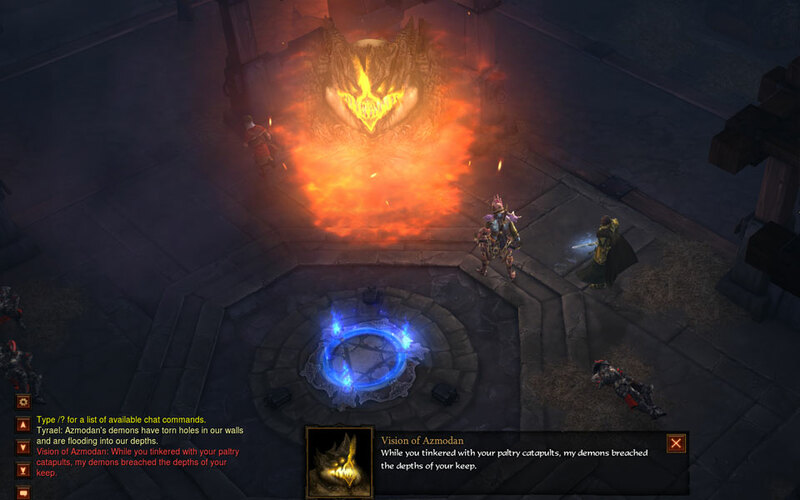 The unfortunate reality is that opportunities to do that in Diablo 3 are very limited. The loot you get while adventuring together with your friends might be better than your current gear, but it typically takes a lot of grinding in order to do so to get the gear you need to progress. Recently I did two posts about a player's interaction with a game, covering how the game can train a player and how this can led to an undesirable narrowing of gameplay options chosen by the player. So, in the spirit of continuing this series of posts, I want to discuss how The Shattered War reacts to the player, and how this can affect and influence their gaming experience. Within the process of playing a game, the first step is for the game to introduce itself to the player and explain its mechanics. While this is essential for a game to ensure the player is not overwhelmed, gradually new elements are introduced to increase the complexity of the experience. As the Shattered War is a standalone experience set after the main campaign, it can be expected that most players will have played it, and thus have some background in the mechanics of the game and the setting itself. As such, The Shattered War does not start the player at level 1 and force them to start off with a miserly array of combat options. 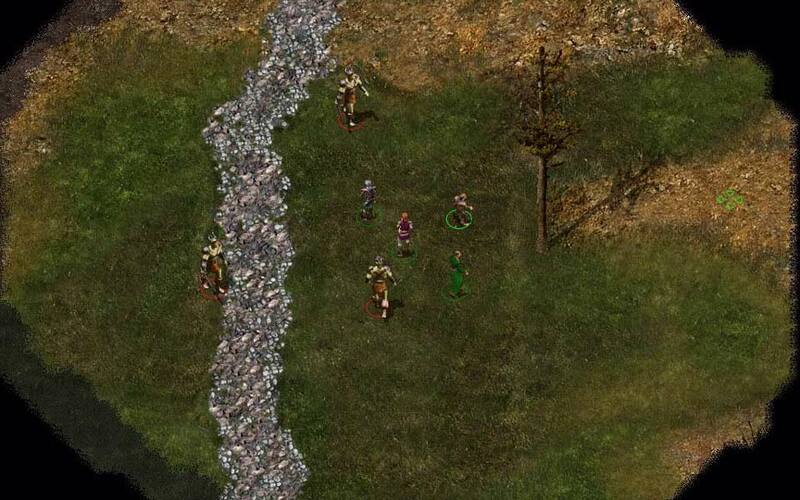 Right from the start of the module, the player is given numerous tools to deal with all situations. However, new items and placeables have been created to add a little more creativity to the mechanics. One such example is the medic table, which allows a player to rejuvenate their health/mana/stamina. This is only available at certain encounters, and can prove the difference between life and death in challenging fights. Of course, doing so takes time and will remove the character from the fight, making it more difficult for party members still engaged in battle. In addition to fighting, another key aspect of the game's reactions to the player is the way that the narrative progresses in response to player actions in dialogue and even in their quest choices. One of the things I'm aiming to do is to make it such that the player will need to make choices that they won't be able to have everything they want, but more importantly that they feel like those choices have been validated. For anything the player might have lost from not pursuing one course of action, they will gain something else that may be useful to their cause. A key concern here is that the player feels that their action was a perfectly valid choice. Every decision must feel like a logical extension of the story and must flow naturally, else the player will feel as though their actions have been penalised. Every possible outcome presented should be as though it is the only story, and do as little as possible to draw attention to the variations within. Whether characters live or die should feel natural to the player. Will these characters survive the experience? It could be your choice. In this regard, some of the choices are designed such that the player should not necessarily realise they are making a choice. The approach is such that a player makes decisions or choices in the people they support and the quests they choose to pursue. Furthermore, the player is not given a penalty for pursuing different roleplaying options. Decision making can be pursued regardless of the character's moral disposition, allowing them to side with one person or another with freedom. The actions of the player are met with equal, but different reactions for every choice. Gameplay decisions with significant benefits will also cause comparable negative consequences, but these are balanced among different choices. This way each set of choices allow the player to feel some reward, but also some temptation to wonder "what could have been". This is the way for every action and reaction to feel unique and special to each player, and to allow them options to play and replay the adventure to experience different outcomes. (Don't) Add multiplayer to ALL THE GAMES! Every game must have multiplayer, or at least that's the mindset of many publishers of AAA titles. Mass Effect 3 added it, so did Dead Space 2, and Dragon Age 3 and Dead Space 3 are set to as well. GTA IV, BioShock 2, Max Payne 3, and a list of sequels a mile long all have added multiplayer gameplay into their titles. The big question I have is simple: Why? The immediate answer is "because players ask for it". So many fans on forums when asked "what do you want?" immediately jump to "multiplayer" as a default response. Playing with or against friends is an immediately popular concept, either from a competitive "I want to prove I'm better" mindset, or a "yeah, I'd like to have fun with a friend" ideal. I don't begrudge this desire at all, but it needs to suit the game. To simply say "I want multiplayer" is a horridly shallow, shortsighted, and unimaginative response. I expect better from the gaming community at large. We all should. 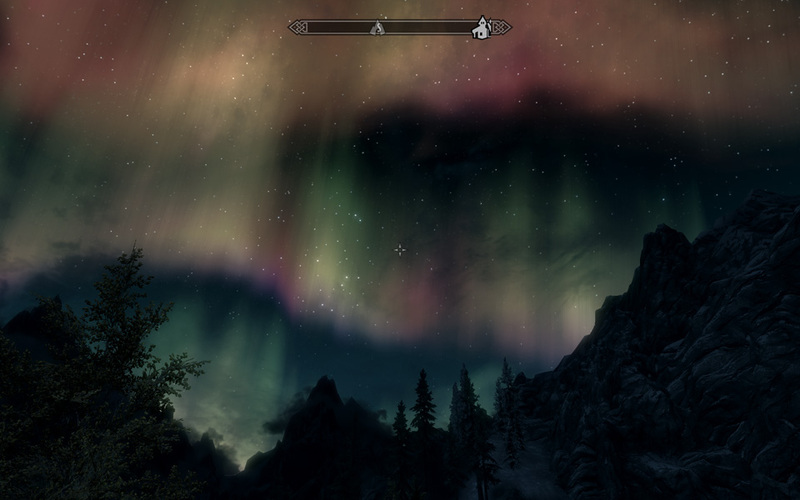 Skyrim, even with its flaws, showed that single player games can still sell. Lots. To demonstrate how terrible this "adding multiplayer equals better game" mindset is, take the example of a roleplaying game that according to its design ideals and marketing is focused on choice and consequence. It's a game that provides an ongoing, complex narrative that is as a cinematic experience. The default choice for story based (and roleplaying) games used to be a cooperative approach, because this allowed players to work together towards a goal. When you introduce this kind of narrative, particularly when you have a voiced protagonist (which is becoming increasingly popular), then a second player becomes a second-class citizen. Of course, the problem isn't limited to this type of game. Even to pull one of the worst examples from the action roleplaying genre, Dungeon Siege 3 offered no ongoing benefit to the second player in a multiplayer game, who couldn't import their own character, or gain any items or experience from playing with a friend. Imagine playing as Commander Shepard's mute henchmen, Geralt's of Rivia's nameless sidekick, a silent mook accompanying Nathan Drake, or any other equivalent. Or take Gears of War 3, where a playable character (for the second player) is summarily killed and they're forced to play another character instead. The fact that character is new, underdeveloped and not really all that interesting is just a further kick in the guts. 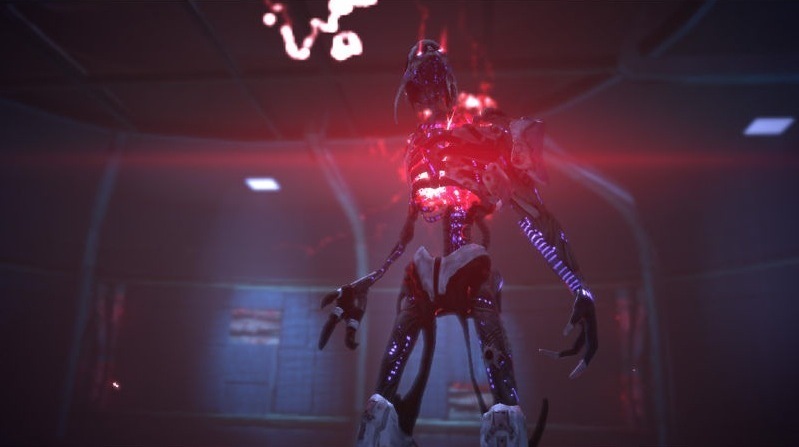 Imagine Mass Effect where you can only shoot bad guys. Not really as much fun. On the other hand, we have multiplayer. Looking as Mass Effect 3 as a prime example, we've got a fairly simplistic cooperative "horde" mode, which lacks any long term depth or challenge. The difficulty levels don't really differentiate between player skill to a large degree, but instead are heavily reliant on gear, which is obtained through either the repetitive grind of playing lots of matches to obtain virtual credits or spending real money to obtain the virtual loot which allows you to deal more damage. The only ongoing effect is these standalone matches is the equipment, and a rather clunky mechanic whereby the multiplayer affects the outcome of the singleplayer experience. The loot grind is a more like an MMO grind than anything else, but the bigger problem here is BioWare's insistence that an "ideal" ending can be obtained without playing multiplayer, which unfortunately is a false claim. 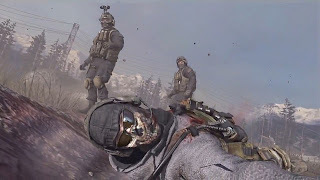 In order to obtain the "best" ending of the game, it's necessary to play multiplayer in a series which had previously been exclusively single player. This is a terrible way to treat fans: forcing them to play content which they may not be interested in order to get a reasonable outcome from the gameplay they actually wanted and which had been the reason they became invested in the series. The core problem is that a story driven cinematic single player experience and a "game-based" pure gameplay multiplayer experience don't fit well together. It's an attempt to get different player sets to buy one game, and is likely to not deliver sufficiently to either group. 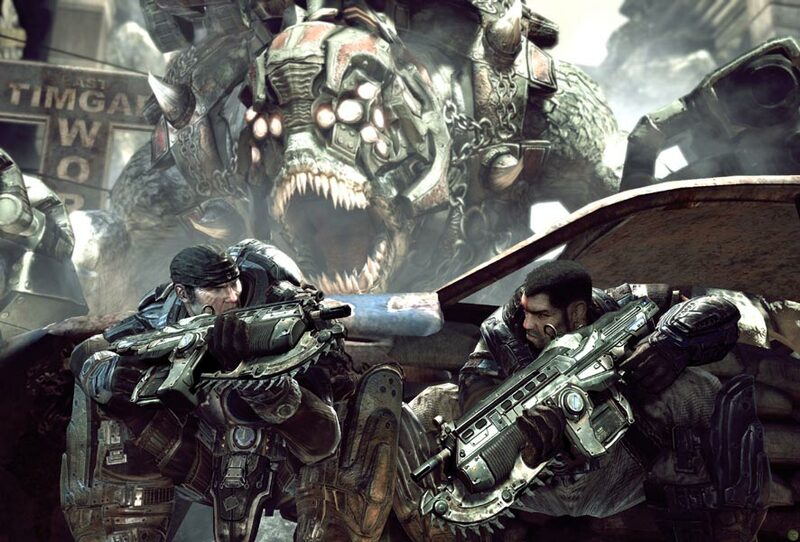 Yes, there is going to be some overlap in the audiences, but I know more than a few people that would have never touched ME3's multiplayer had they not needed it in order to get the best ending. 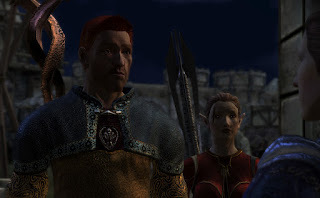 The choices, consequences and cinematics, along with the choice of a single voiced protagonist, have made the inclusion of on-going co-operative play a la Baldur's Gate and Neverwinter Nights undesirable. This means that whenever players cry "we want multiplayer", the only choice is for developers/designers to take the existing ruleset/mechanics and shovel it into a standalone experience separate to the main game. The problem is that frequently the ruleset or mechanics for a singleplayer experience aren't balanced for competitive Player versus Player (PvP), particularly for roleplaying games, which means that this idea is off the table. This means the only choice is a Player versus Environment (PvE: fighting against computer-controlled AI enemies) experience, and given that it has to fit into budget contraints and timeframe of the single player game (which is the "main" drawcard), it will be small in scope by necessity. It's a single AAA title, and thus has the budget of one. Putting resources into one takes away resources that would be used for the other. That's simple business. Yes, I know this will cue cries of people spouting the defense "ME3's multiplayer was done by a different team", but the fact is the money spent on that (not to mention the mediocre kinect integration) is money that could/would have otherwise been spent on the singleplayer experience - which was the prime reason people were interested in the series. The simple truth is that multiplayer isn't a vital part of the gaming experience, and many times it's underwhelming and underdeveloped when included in a game. However, this is not necessarily any fault of the designers. It's often the case because multiplayer was never intended to be the primary selling point of the game. The single player experience was meant as the drawcard, with the multiplayer there as a bit of a bonus. In some games, it's the other way around. Battlefield and Call of Duty thrive on their multiplayer, and the single player aspects aren't the main selling point. If the producers/publishers demand that multiplayer be included (and I only say that because of EA's policy that "every game will have multiplayer"), then sell it as a separate product for a substantially reduced price. Sure, piggyback on the engine and assets of the core game, but don't include as part of the same game. Spend a little longer on making gameplay with a little more depth, and release an associated multiplayer game. If the game/brand is strong enough, then both games will sell, and they'll cater to the different markets that go for those different experiences. Heck, from a publisher standpoint, they have the opportunity to make even more money. b) The product isn't good enough. What if Mass Effect 3's multiplayer had been a standalone game that could be purchased for $10? It would have lost some sales from people not interested in multiplayer at all, but at that price, I imagine plenty of people would have gone "that's cheap, I'll check it out." I'd hazard a guess that it would have even got some sales from people not interested in the single player at all. BioWare could have still even pushed linkages between the two games and maintained the (awfully designed) linkage between the singleplayer and multiplayer. Shoehorning a conflicting multiplayer experience into a singleplayer game isn't satisfying for the consumer. Don't attempt to appeal to everyone with a single product by adding in popular gameplay elements from everywhere. If you do that... you end up with Darksiders. Its attempts to cater to everyone detracted from the game rather than adding to it. Not every game needs to have multiplayer. Not every game should have multiplayer. If the industry maintains this kind of mindset, then the gaming market is going to become even more stagnant with cover based multiplayer shooters than it already is. That is not a good thing for an industry that has the potential to be so much more. So today you may be aware that EA announced that their title Mass Effect 3 would be released on the Wii U platform. Now, aside from the whole controversy about the ending, this raises one question: Why? 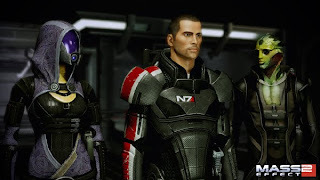 Some BioWare employees have said that Mass Effect 3 itself was an ending, as in that the aim of the game was for the entire game to be an ending to the story of Commander Shepard and the individual stories of the characters players had come to know and love. If this indeed was the whole point of the game, then what purpose is there in releasing an ending to a group of players who have not experienced the rest of the story? Shepard... why are we here? Admittedly, BioWare faced a smaller version of this problem when they released Mass Effect 2 for the PS3. 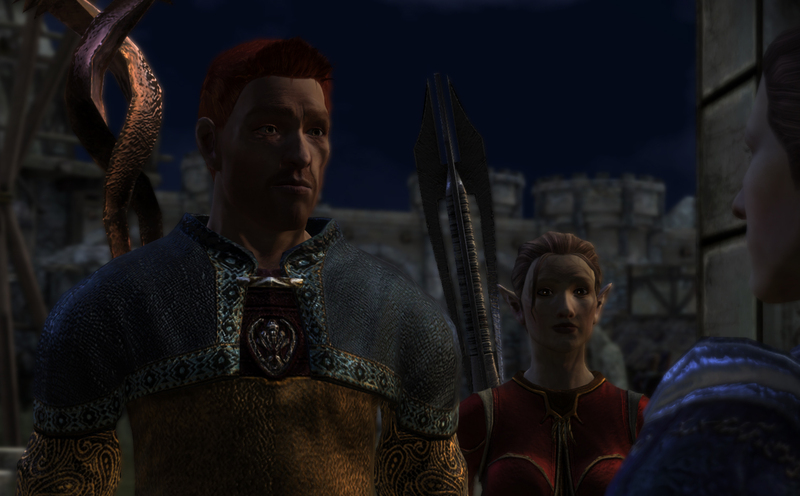 PS3 owners had not experienced the first game, and thus had to rely on an interactive comic to introduce the setting, characters and key plot points of the first game. They still got to experience a raft of new and returning cast members in ME2, which then carried on to ME3. Wii U owners have none of this, and thus have no reason to care about the culmination of the struggles as they reach an emotional crescendo in ME3. 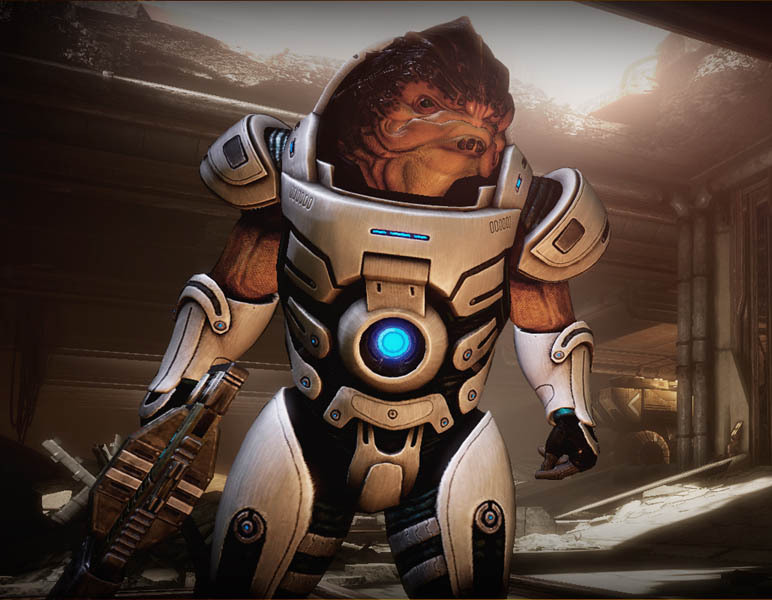 Simply put, ME3 is primarily designed to cater for an invested player. It brings to a head the moral conflicts that have played out through the rest of the series, and relies on the context of those struggles and their effect on the characters that the player knows for their impact. Without that context, these scenes have little meaning to the player. All the cameos, the deaths, the sacrifices, and the decisions have very limited impact because the player does not know the characters. Shepard might, but the player doesn't, and they have been given no reason by the game to care. The harsh truth is that this is a failure of basic storytelling. A player cannot care about a conflict unless they are invested in it, and the key way the player becomes invested a conflict is through characters. A player needs someone to empathise with, and when the conflicts are happening between two other characters (as is the case for virtually all conflicts in ME3), a new player has no real reason to feel empathy for either side because they are jumping in with no backstory. Anyone going straight to the end of a story with no context does not actually care about the story, and herein lies the rub. The release of ME3 on the Wii U sends a disturbing message of: "We don't care if you haven't experienced the story we've told this far, it doesn't matter." Or even worse, it says: "We don't actually care about the story; the gameplay is fun." Sure, Mass Effect 3 might be a great game (sans ending), but this release appears to be nothing more than an attempt to make money while simultaneously rejecting the value of the writing of the series. This is possibly one of the worst indictments on the series that has been made, as sacrificing the integrity and value of the writing of the series for sales on a new platform is nothing short of appalling. In my last post, I discussed the benefit of rewarding the player for specific actions. This is the means to train a player how to play a game "successfully" and gives them something to aim for apart from mere completion. However, rewarding specific behaviour can be a problem if a game allows multiple solutions to the problems it presents to its players. 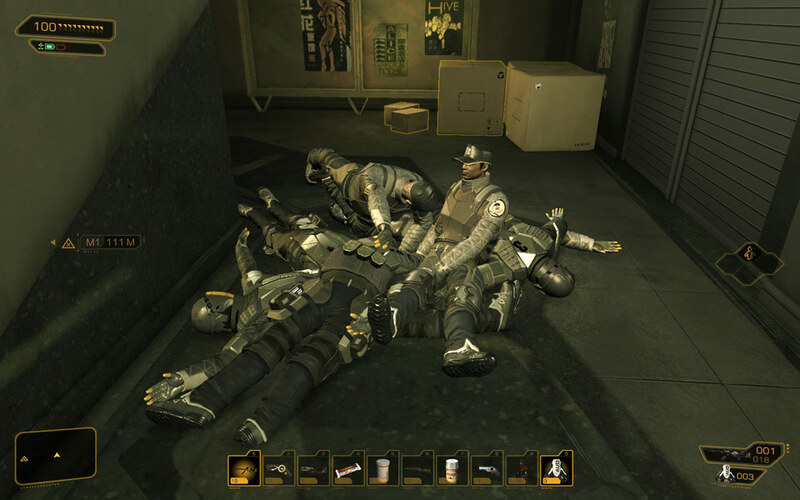 One of the best cases in point here is Deus Ex: Human Revolution, a game which I should say that I mostly enjoyed. Everyone knows the boss fights were awful, though I also found the entire plot to be woefully predictable, Adam Jensen utterly idiotic whenever I didn't have control of him, and the final phase of the game was nothing short of rushed and a little bit tedious to boot. Those issues aside, the game failed to deliver on its idea of allowing a player to take any approach they wished. Why? Because they provided inequitable rewards for those solutions. The "best" Adam Jensen was a stealthy, elite hacker, explorer, pacifist. He skulked around the shadows, meticulously exploring every nook and cranny, hunting down every hidden corner or passage way. No computer system was left untouched, and even if he had the password to a computer account or code for a keypad, he hacked the thing anyway, just for fun. He didn't kill anyone, but prided himself on artful takedowns, preferably incapacitating two people simulataneously with his superhuman reflexes. Why was this the "best" Adam Jensen? Because the game told you so. Non-lethal takedowns gave more experience than kills, particularly when you took down two people at once. Every secret hiding hole gave you experience, but blasting through a level quickly rewarded you with nothing. Every hacked device gave you experience, but entering a passcode or password gave you nothing. The "best" Adam Jensen was a super-augmented super-human, able to solve almost any problem. 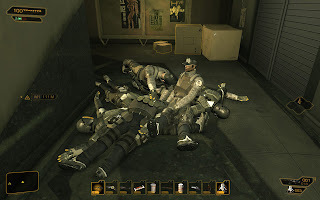 An Adam Jensen who went in guns blazing, solved problems in half the time and left a horde of corpses in his wake instead of incapacitated foes, was far inferior, ending up with far fewer skills and abilities. Now, as someone who happily jumped into the role of the "best" Adam Jensen by choice without knowing about his inherent superiority, I was surprised when discussing the game with some of my friends about their different experience with the game. Their challenge of scrimping and saving praxis points to spend on only the essential skills didn't match at all with the game I was playing. Simply put, the game wasn't rewarding them equally for their behaviour. The game was mandating a "best" option, despite telling the player through narrative and other gameplay elements that "any approach works". This was also part of the reason why the boss fights were so heavily criticised - because the "best" option that had been mandated throughout the rest of the game suddenly turned into the worst option for the boss fights. You picked stealth? Oh dear. Counter to this, one of my flawed game darlings of the past few years, Alpha Protocol, didn't fall into the same trap. 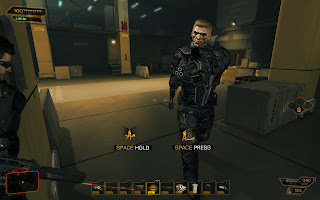 Alpha Protocol gave numerous rewards to players as a result of their actions and choices, but these were distributed evenly, and furthermore even helped augment your chosen skills. If you engaged heavily in stealth and non-lethal takedowns, cooldowns for related skills could decrease. If you went in guns blazing and killed lots of foes, you'd get damage and/or accuracy bonuses to your weaponry. Even your relationships with NPCs worked in this manner of providing different benefits; if someone liked you, you'd receive a bonus. If you didn't get along with them, you'd get a different bonus. Both options represented a different kind of relationship with your "handler" providing different advantages to your character. For me, this was a superb example of how to reward player decisions differently, but equitably. Alpha Protocol wasn't without a bunch of other flaws, but ultimately I found that the concept of choice and the ability to choose how you wanted to play was more meaningful than compared to DE:HR, because those choices ended up with the player being given different options rather than fewer options. If you're going to reward a player for taking successful actions, but offer different approaches, then unless you're specifically looking to promote a particular course of action, all rewards should be equitable. The rewards can be different, and I would contend this is the ideal situation, but a player should never feel penalised because they made a specific choice that was offered to them by the game.